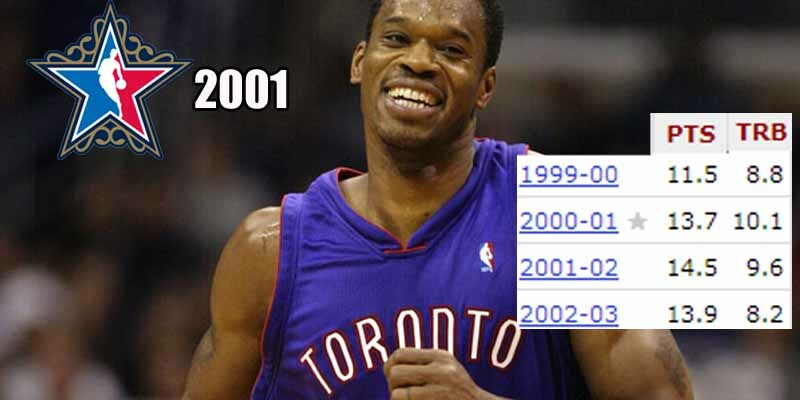 Antonio Davis had by far the best years of his career with Vince Carter and the Toronto Raptors teams of the late 90s. Before the Pacers traded Davis to Toronto, he only had one 10+ PPG season. With the Raptors, he had four consecutive double digit PPG seasons, along with 8-10 rebounds to go with that and a 14PPG/10RPG double double in 2000-2001, which earned him an All-Star appearance. Davis was also one of the top offensive rebounders in the league, finishing top 10 in three consecutive seasons with 3 per game.